Worship | Shall we Sing a Song for you? Carl Trueman spoke in Stranmillis EPC a few weeks ago on the subject ‘The reformation – this stupid and pernicious tragedy?’, a title which was ‘borrowed’ from a recent lecture in Belfast by Professor Diarmaid MacCulloch. In light of his comments during the lecture on Luther coming to the belief that God is primarily present through the proclamation of his Word, he was asked for his views on talk of scrapping – or not starting with – two services, for reasons such as freeing the minister up for evangelism. The audio of the 8 lectures he gave in Dublin on the following two days is also available here. Publisher: Crown and Covenant (2012). 154 pages. What type of person do you think is least likely to walk into an RP Church? Whatever criteria you draw up, Dr Rosaria Champagne would have been likely to tick most of the boxes. When she walked through the door of Syracuse RP Church in New York state in 1999 (after two years of weekly visits with Pastor Ken Smith and his wife Floy) she was a feminist, an associate professor at Syracuse University, teaching in one of the top Women’s Studies departments in America, and being recruited by other universities to advance radical leftist ideologies. Her speciality was Queer Theory (a postmodern form of gay and lesbian studies), and she was in a relationship with another woman. Yet a few months after that first visit to church her life was, as she puts it, ‘train wrecked’ – she was converted. Today she is an RP minister’s wife and they have four adopted children. This book is the story of her journey – not just telling the story of her conversion and its huge impact on every part of her life, but also touching on homosexuality, racism, fostering, adoption, RP worship, parenting, homeschooling and much more. It is an absolutely fascinating page-turner of a book, not least as it features many people you may well have met. 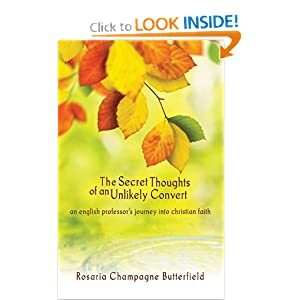 Nor did Butterfield lose her critical faculties when she became a Christian – some of her critiques of attitudes she has encountered from Christians may be close to the bone, yet they are hard to argue with. You may writhe uncomfortably at times like the Geneva College chapel audience did when she told them that the reason why over 50% of Christian marriages end in divorce is that Christians act as if marriage redeems sin – when that’s something that only Jesus can do. Her take on homeschooling is also fascinating. While she ultimately embraced it as her preferred educational option, her critique of much of American Christian homeschooling culture is also intriguing. The stories of some of her and her husband’s fostering and adoption experiences range from heart-warming to heart-breaking. I bought this book on my last day in America, started reading it on the way to the airport and had it finished by the time we got home. I would be fairly confident that many others would find it similarly unputdownable. It’s absolutely absorbing – buy a box and give one to all your friends!